This exciting all-inclusive resort is located right on the beach of Arena Gorda, with dazzling white sand and turquoise waters beckoning just steps away. The resort features two relaxing pools, a spa and beauty salon, and a variety of restaurants to suit every taste. 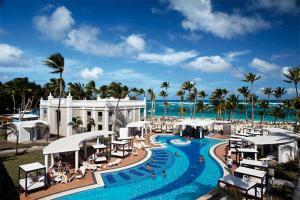 Guests enjoy “stay at one, play at four” privileges with the sister hotels Riu Palace Punta Cana, Riu Bambu and Riu Naiboa. Clients staying within the RIU complex have free unlimited access to the New Splash Water World. 19 miles from Punta Cana airport, beachfront on Arena Gorda.